LG is aiming to bring popular smartphone and tablet games to your televisions in 2013. Gaming on the television is something that has been discussed frequently over the past couple of years, and while there have been a few forays into the field, it appears that LG is going to get serious about it in 2013. 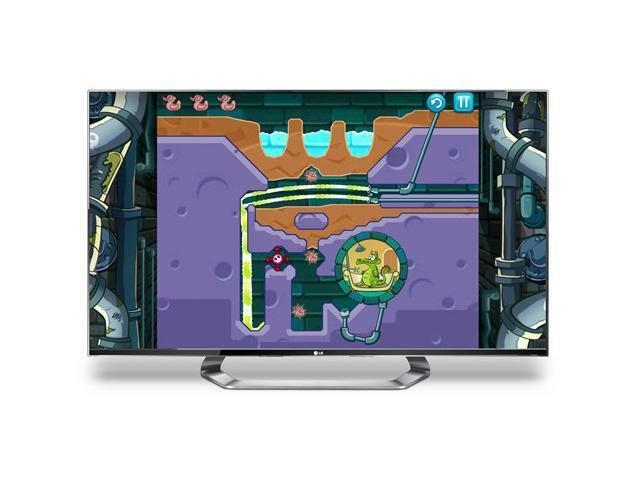 "Our extensive library of games has been growing steadily since we launched the first 3D titles for Smart TV last July," said Havis Kwon, President and CEO of the LG Home Entertainment Company. "The whole family can enjoy some of the world's most popular games right in their own living room. Magic Remote, Dual Play and the controller app for smartphones demonstrate our commitment to bringing a better gaming experience to CINEMA 3D Smart TV owners." Some of the titles you can expect to see include Where's My Water, The SimsTMFreePlay, Air Penguin,Mini Motor Racing. All of the games will be playable with LG's Magic Remote which has also been retooled with motion-sensing. SEOUL, Dec. 27, 2012 –– LG Electronics (LG) announced the arrival of several new games for its CINEMA 3D SmartTVs with hand-picked titles offering some of the best family-friendly, interactive fun around. Long popular on smartphones and tablets, the acclaimed titles include Where's My Water, The SimsTMFreePlay, Air Penguin,Mini Motor Racing and many more. Each game can be played using LG's new and improved motion-sensing Magic Remote. "Our extensive library of games has been growing steadily since we launched the first 3D titles for Smart TV last July," said Havis Kwon, President and CEO of the LG Home Entertainment Company. "The whole familycan enjoy some of the world's most popular games right in their own living room. Magic Remote, Dual Play and the controller app for smartphones demonstrate our commitment to bringing a better gaming experience to CINEMA 3D Smart TV owners." An instant classic, Disney's Where's My Water soared in popularity to become the number one downloaded game app on the app store in 90 countries. Over 2 billion showers have been taken since its launch. LG CINEMA 3D Smart TV's larger screen size and intuitive Magic Remote add another layer of player immersion to Disney's run-away success. Also arriving is The Sims FreePlay from leading game developer and publisher, Electronic Arts Inc. (EA). The enjoyable "real world" simulation builds on The Sims series, which sold more than 150 million copies worldwide. In addition to using the Magic Remote to control the onscreen action, players have the option of downloading a convenient remote controller smartphone app specifically designed for The Sims FreePlay. Selected titles have also been optimized for 3D such as Mini Motor Racing, developed by The Binary Mill and powered by Unity Engine, which also supports LG's Dual Play feature. Perfect for two-player games, Dual Play uses LG's FPR 3D technology to allow each player to see their character in full screen, instead of the more common split-screen view. All the games will be demonstrated on LG CINEMA 3D Smart TVs at CES 2013 in Las Vegas (USA). Each title will be downloadablefrom LG SmartWorld beginning the first quarter of next year.